On Wednesday, December 8, Ameca I, the northbound one of two bridges connecting Riviera Nayarit with Puerto Vallarta, reopened to traffic in time for the upcoming holidays and high winter tourist season. The bridge had been undergoing refurbishment after severe storms forced its closing at the end of August. Traffic between the two tourist destinations which had been serviced in both directions by the southbound bridge Ameca II during the Ameca I refurbishment, is again flowing smoothly, and at a good pace. Drive time between the Puerto Vallarta airport and Nuevo Vallarta, Riviera Nayarit is an easy convenient ten-minute trip. Riviera Nayarit and Puerto Vallarta are connected by the two bridges that span the Ameca River, northbound by Ameca I, and southbound, by Ameca II. The refurbishment of the Ameca I bridge that spans a total of 2,624 feet was funded entirely by the Federal Government. The inauguration of service on the bridge took place during a small ceremony presided over by Governor Ney Gonzalez and by the head of the Department of Communications and Transportation, Juan Molinar Horcasitas. 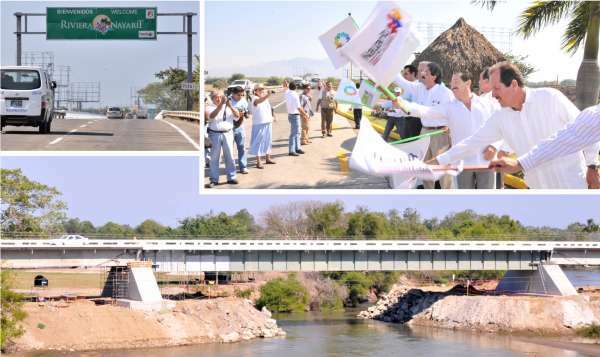 The refurbishing of the bridge was possible because of the joint work of Ney Gonzalez, the SCT and the governments of Jalisco and Puerto Vallarta, respectively. The Convention and Visitors Bureau of Riviera Nayarit celebrates this accomplishment, which will allow for an optimum travel experience for all tourists that visit this region.